CANMORE lists this stone simply as a cross, although it was marked as a standing stone on the 1961 OS map. 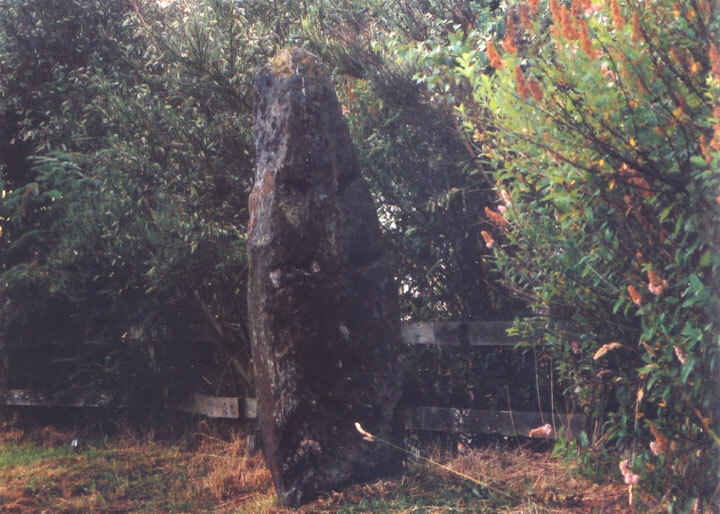 The stone is a large slab, 2.0m in height by 0.6m wide and 0.2m thick, giving it similar proportions to the nearby Clach Glas. On either side is carved a large simple cross, but it is clear from looking at the stone that this is a christianised standing stone. Writing in 1925, JH Dixon described how it was supposed to have been connected with a chapel of St Maroc on the terrace above the Tay‘s flood plain, although no trace of such a building can now be found. Haugh Cottages is in the parish of Dunkeld and Dowally and the county of Perthshire. Published on the 14th of May 2010 at 4:20 pm. Updated on the 16th of July 2013 at 1:26 pm.